I’ve been winding down my little herb and vegetable plantation (read: pots and planters filled with herbs and greens) in order to prepare the planters and pots with fresh compost and soil for planting up of fresh seedlings for Spring. So my harvest is small, but it sure packs a punch. 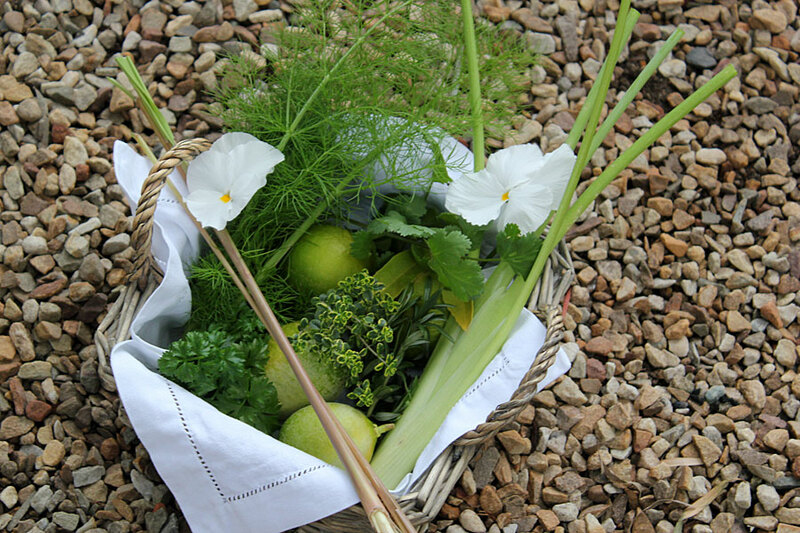 For our August Garden Bloggers Harvest Day I’ve managed to fill a basket with wonderful herbs we will use in out kitchen for the next day or so. Judging from whats in the basket, I suspect a great Thai-inspired seafood dish might be on the menu. What’s in my August basket? The Violas (or pansies) – there are plenty more happily growing and flowering in the garden so we can pick them if and when we want to use them. Using them in the kitchen is something we’ve never done before and I am experimenting. I doubt I’ll use them for anything other than decorating a dish maybe. 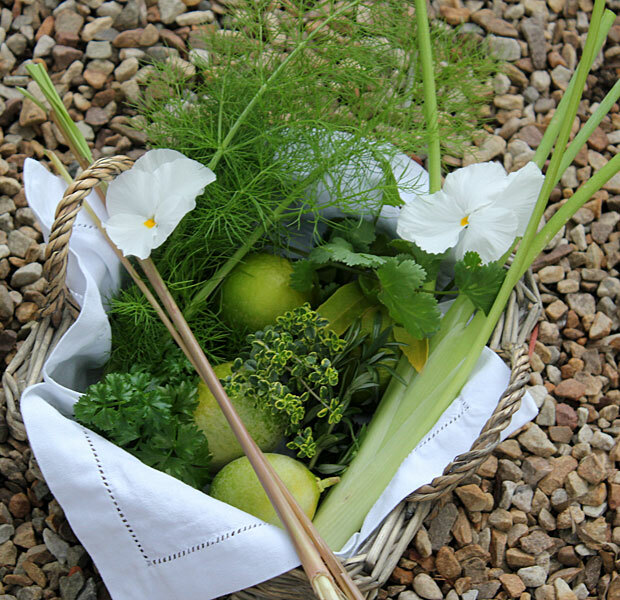 The Fennel – My very first fennel stem harvest. We have been using the fronds already. They are rather nice in a salad and we’ll try the first harvest of the celery-like stems in a dish tomorrow. 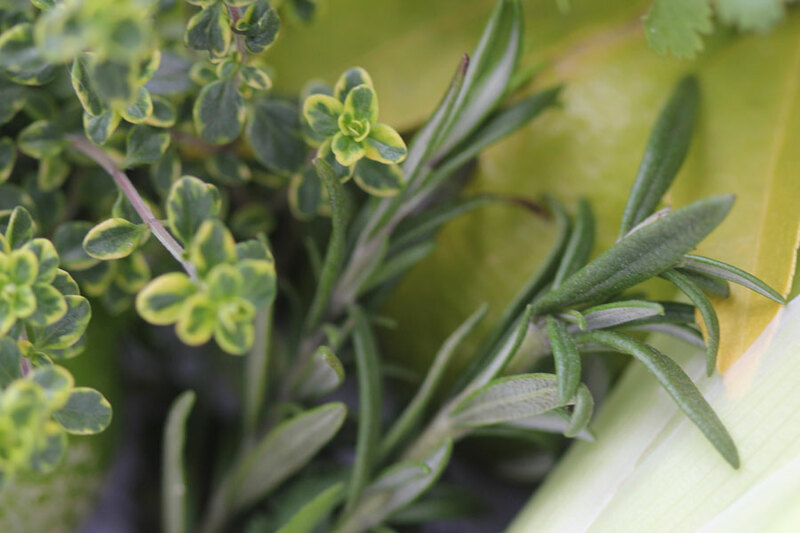 Lemon Thyme is a lovely herb and Rosemary we use regularly. It really is at its absolute best when it’s picked fresh from the garden just before use. 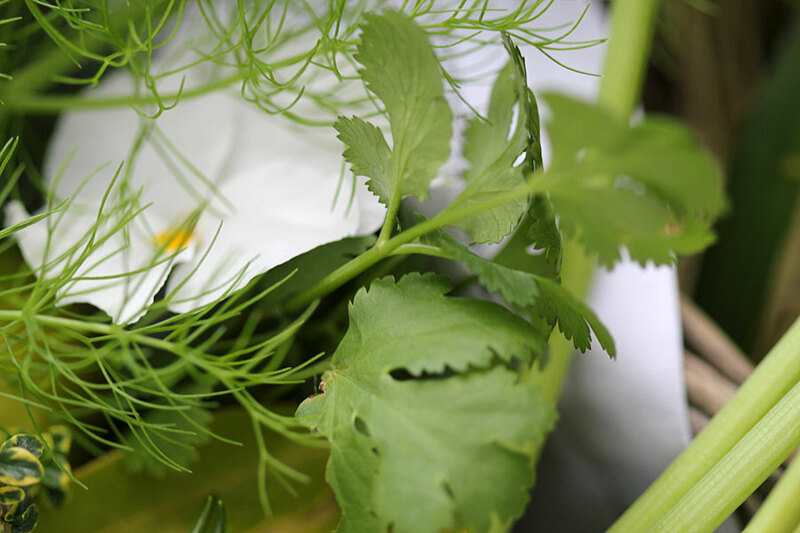 There is plenty of parsley and the coriander is doing great in this cooler weather (I find it bolts very quickly here in Spring and Summer and I have to continuously replace my Coriander plants in the hot weather if I want fresh coriander on hand. (We use it a LOT in our kitchen). The limes are wonderful, we use them all the time and never seem to have enough. I love the Lemongrass plant. It’s lovely to look at looks great in any perennial planting scheme, but here it holds pride of place in my veggie planter because I love it in there. We don’t use lemongrass that often, so for me just one plant seems to supply us with all the fresh lemongrass we need. When I pick a couple of herbs from the garden and don’t plan to use them immediately I stick the bunches in these little ‘vases’ and they stay fresh and lovely for a few days and are always ready for throwing into a dish. And they look and smell great in the kitchen. Lovely! My hands have the most wonderful lemony-herby smell on them after this little harvest! What herbs or vegetables are you harvesting or growing in your garden right now? Please do join us for Garden Bloggers Harvest Day and share photos of your bounty with us all. Christine, I think I was there during June a few years ago, and it struck me that you could basically garden 12 months of the year there, no? Do you wind down, just cause you need a break? I definitely do that… I don’t plant ‘winter season’ vegetation of the most part. Interesting that you plan to cook a Thai-inspired dish. We eat in Thai restaurants in the UK, but not many attempt to make it at home. If I had that basket of goodies I would make french fish soup. I am amazed at this winter harvest…I love lemon thyme and mine is a bit stressed in the drought but still a trooper. 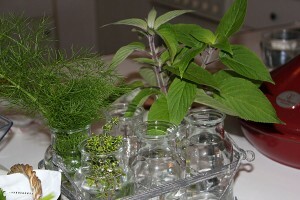 I love to cut and use the herbs too and put them in a vase if I don’t use them right away. I wish I could grow limes and lemongrass. We use cilantro as well and boy it has bolted this summer no matter what I do. Wonderful harvest! That’s a beautiful harvest! I’m jealous of the coriander and limes. Let us know what you cooked up! Thanks Alan – The Coriander is fantastic at the moment. It obviously likes cooler weather here. Its exceptionally tastey at this time of year. I too commend your presentation. It looks like a magazine spread. WOW!!! That basket looks like it belongs in a MasterChef kitchen! So full of flavour and beauty too! The lemony smell on the hands makes it all so worth it! 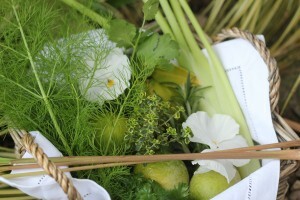 You have introduced me to fennel and I have made tea and used the new shoots in salads – amazing!!! 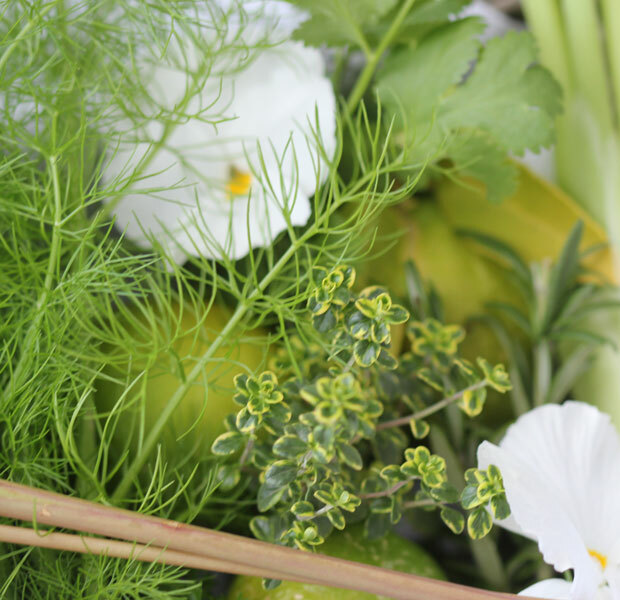 Hi Barbs – I love the fennel fronds (sparingly) in salads – gives a lovely extra flavour layer thats very different. Try it will rocket, figs, pimento and some prociutto – yummy! Anything you cook will taste great with those ingredients. Lovely presentation. Thanks Mary. I’m loving the fresh rosemany in particular. Nothing beats freshly picked. Hi Christine, great post, we only recently found the pleasure of growing herbs in a long container. They don’t seem to find their way onto the dining table in any way, but they look good as does the bronze fennel in the border. 10 out of 10 for presentation, lovely little basket of delights!